Wherefore the Dark Side? Take a deep breath. There is a clear path to victory over the Trumpocalypse. There’s a moment when you are about to lose your temper that is the difference between growth and disaster. It is the moment between anger and violence that can create wars or peace. In the terminology of the great business philosopher Steven Covey, between “stimulus” and “response” there can be “wisdom”. Employing wisdom in that space between stimulus and response is called maturity. This a very important moment in American history. Our current crisis can destroy us, but it can also be the chance for America to develop, mature, and grow to a more perfect union. This is a horrible moment, and a precious moment, but the truth is we’re all pretty angry right now. We’re all pretty afraid. Conservatives have long been angry at the left. From a classical critique of New Deal excesses, conservatives added a galaxy of imagined slights. They created billion-dollar icons of resentment from Rush to Brietbart to Fox. They have sewn rancor deep enough into the American psyche that we managed to elect a white supremacist conman as President of the United States. Now, Liberals are angry too. Conservative resentments during the Obama years were channeled into massive political gains. Republican obstruction in Congress and media messaging were parleyed into astonishing successes in legislative might nationwide. 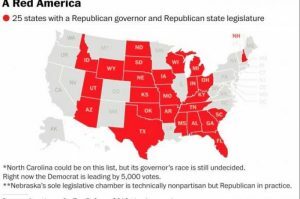 The American political landscape now boasts thirty-two Republican Governors. Sixty-six of ninety-nine legislatures are Republican controlled. In twenty-five states, Republicans hold complete legislative control. In all, Democrats lost over 900 elected offices during the Obama years. Moreover, gerrymandering has given Republicans a prohibitive majority in the House, despite Democrats’ continued popular vote majorities. Not content to govern, Republicans are taking this opportunity to push legislation nationwide, overturning democratic, workplace, civil justice, environmental and health protections of unprecedented volume and impact. In the midst of all of this conflict. President Trump’s recklessness, arrogance, and intolerance make him appear hell-bent on provoking civil war in the streets. It’s horrible, but it’s time for progressives to take a deep breath. ark Side. Fear leads to anger. Anger leads to hate. Hate leads to suffering. The anger and the hate of the right have led us to this dangerous moment. If we as a nation are not to succumb to the same anger, we need a bit of wisdom. We need a bit of clarity. We need to ask the right questions to save us from slipping into darkness. What is happening here? Why are we in this trap? What are the forces at play driving us apart? In the run up to the #Brexit vote in Britain, Owen Jones, writing for the Guardian, was able to get a broad perspective on Western politics in his brilliant profile of Spain’s Podemos party: There is a model for the politics we need. It is in Spain. Mr. Jones has really put his finger on it. In the heart of this is the crux of our political and cultural dilemma. This truth has taken shape in its own way in America to fit our cultural and political economy. These three forces have brought us here: the anger movement, the money movement and the justice movement. The path forward requires passion, clarity and calm, but victory lies ahead. THREE MOVEMENTS. TWO PARTIES. ONE UGLY MESS. Money itself isn’t evil. We need commerce. We need an economic system. We need functioning markets. We need this thing to work. But, if you want to understand evil, follow the money. 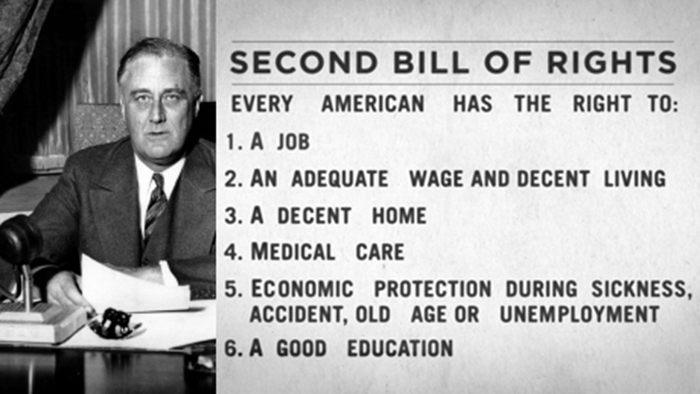 After the Great Depression, FDR instituted a raft of progressive reforms that came to be known as “The New Deal”. 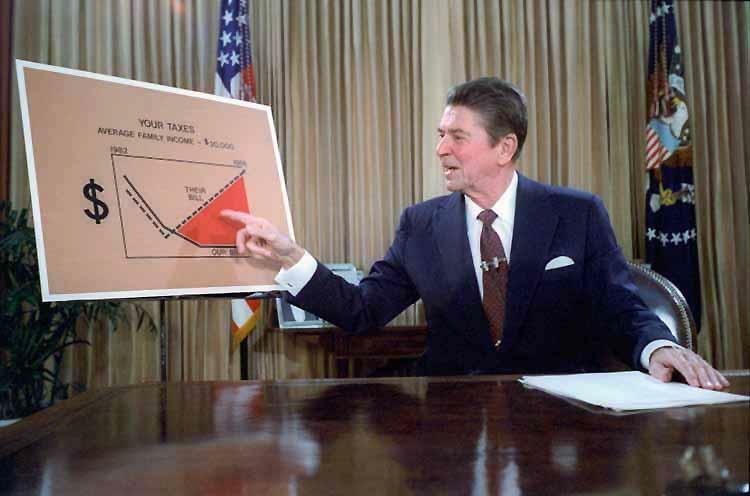 It provided a raft of relief, recovery, and reform programs designed to protect the American people from the highs and lows of the business cycle and the most extreme abuses of the very rich. 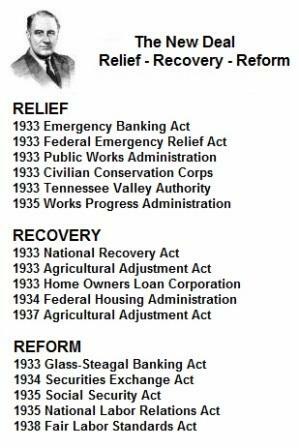 Public Works, Social Security, Banking Reforms, and labor protections all resulted from the New Deal. Stretching for over 40 years, the New Deal era protected and expanded the healthy middle class, increased democracy, and protected fair markets for capitalism to prosper. The N ew Deal era can be seen as the high-water mark for the “Justice” movement, more commonly referred to as Liberalism or Progressivism. Make no mistake, the “Money” movement hated the New Deal. Money doesn’t care if you’re sick or if you die. Money doesn’t care about America. Money just cares about money. 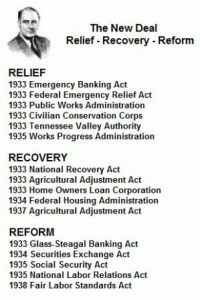 The New Deal created protections for the American people, but the money movement defined these as “stifling regulations” and railed against them. The money movement has been waging its war on the New Deal and the Justice Movement ever since the days of FDR. The reforms and programs of the New Deal were so popular that FDR himself was elected president four times, and term limits imposed after his death to ensure that no future president could use the popularity of the Justice movement to hold the office for life. During the Truman, Eisenhower, and Kennedy administrations, new deal programs proceeded without challenge. Labor power continued to expand wages. As productivity increased, so did middle class wealth. It seemed that the forces of the Money movement would have no hope, but social changes began to crack the Justice voting block. The Anger movement had its home with the New Deal coalition. 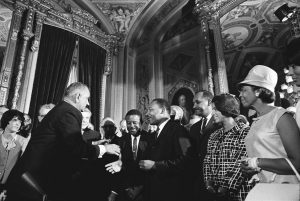 Working whites benefited greatly from the prosperity of the New Deal era, but in 1964 and 1965 President Johnson signed the Civil Rights and Voting Rights acts. 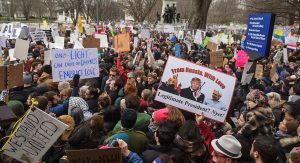 By explicitly prioritizing the rights and inherent citizenship of those scapegoated by the Anger movement, Democrats created the chance for that movement to break away. 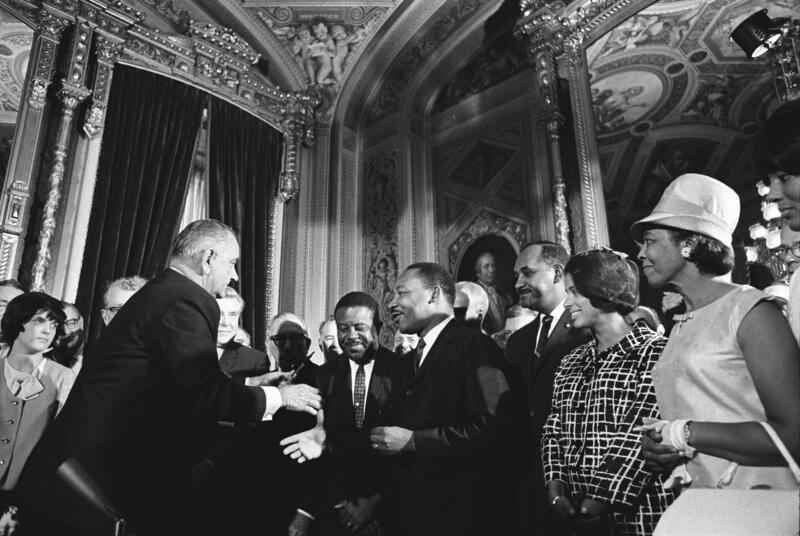 President Johnson famously predicted that his bold, historic, and courageous achievements would “lose the South, for a generation” for Democrats. Republicans, rapidly took the opportunity to add the politics of hate, division and scapegoating to their core financial messaging. Those who required scapegoats like minorities, women and immigrants to justify their anger at society’s ills, found their home in the Republican party. By 1980, Republicans mastered the politics of division. 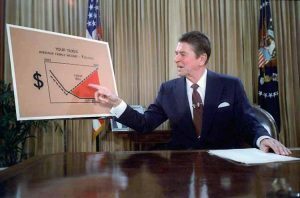 Ronald Reagan brought together the Anger movement together with the Money money movement, which had standardized its political attacks around the idea of “Small Government”, amid a flurry of complaints against government programs and protections. Reagan and the conservative movement that surrounded and lifted him, created a trifecta of perfect political messages. What had been called greed and the excesses of corporate exploitation, would henceforth be referred to as the “Small Government” movement; greed was redefined as freedom. What had been called hate, racism, bigotry, and sexism, came under a new heading of “Family Values”, lead by the anti-abortion movement which sought to remove women’s healthcare choices, and covertly pressed the threat of minorities and immigrants to “upstanding” American culture; hate became family. These were backed by an authoritarianism that foisted fear on the American people; fear of other nations, other people, other races and immigrants. The “Strong Military” movement made hawks of a majority of Americans. Money wanted to prepare for war. Anger wanted to prepare for war. The streets were breeding grounds of crime and the police needed to militarize to protect the people. The messaging victory of the Reagan revolution was nearly absolute. Hate became family. Greed became freedom. Fear became security. Reagan’s 1984 Presidential landslide, in which he won 49 of 50 states, sent shock waves through the Democratic party. Democrats feared that they would never again regain power in Washington. In response to the success of conservative messaging Democrats decided to take an entirely new approach to politics. 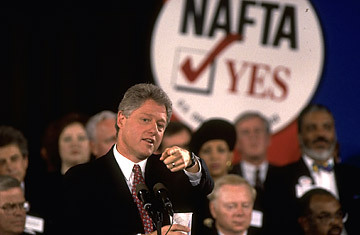 Led by Bill Clinton, Democrats took up a new call: “Fiscally Conservative, Socially Liberal”. Calling it the “third way”, Democrats decided to embrace a broad spectrum of Money movement policies, such as banking deregulation, welfare reform, international corporatist trade, tax cuts for the wealthy, while countering Anger movement scapegoating efforts wherever possible. Thus, as America entered the new millenium, the parties had transformed. The Republican Party remained the true home of the Money movement, but the Money movement didn’t care which party was destroying the New Deal and enacting its Corporate takeover of American Democracy. Republicans were happy to channel the efforts of the Anger movement into it’s Money agenda. Meanwhile, Democrats became complicit in the wholesale dismemberment of middle class protections. Wages stagnated even as productivity expanded. America felt the pain, and while it had a defender of social justice, America no longer had a defender of economic justice. The Justice movement became a junior partner in the Democratic Party. Fast forward to today, and the failure of the Democratic Party becomes evident, as does the way for Democrats to regain control and power in America for the good of the world. By failing to promote economic as well as social justice, Democrats have left themselves open to the perfectly valid charge that there is no difference between the parties. Socially, it may not be the case, but on economic issues, there is little difference. 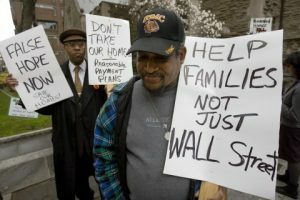 President Obama, for example prosecuted no bankers an d allowed over 9 million further home foreclosures through the Great Recession. Moreover, he failed to prosecute a single major anti-trust case as industries as diverse as technology, media, banking, transpiration and utilities consolidated towards monopoly. The impact of their consolidated money ended democracy in America, leaving us to suffer our current oligarchy. That happened under a Democratic president. Politically, by accepting and championing the policies of the Money movement, Democrats left themselves open to all of the political charges that should have rightly fallen on the Republicans. NAFTA and every international corporatist trade deal are Republican policies, but Democrats bought them, and so in the eyes of the voting public, they own the blame. This brings us to the dire straits we face today. The Money movement is deeply entrenched in both major parties. The Anger movement has overrun its former “junior partner” role in the Republican party to horrifying effect. The Justice movement, has been systematically silenced and kept from power within the Democratic party, but that can change. In light of the astonishing overreach of Anger and Money, Justice is standing up. Protests are spilling into the streets. Nation-wide strikes are immanent. A new ethic of accountability and democracy is possible. 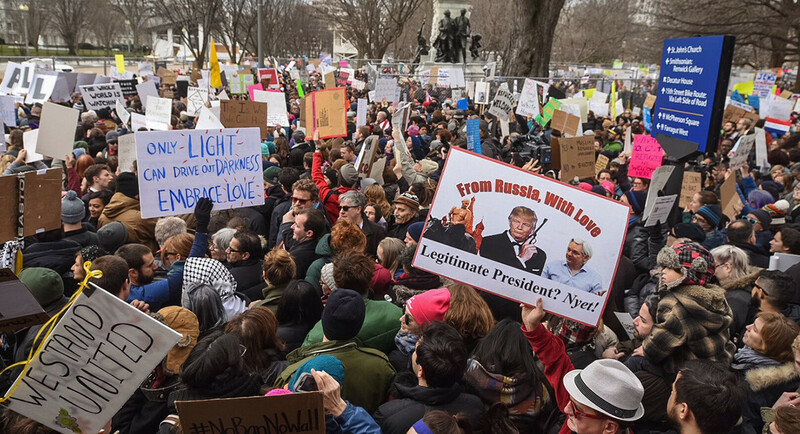 The force of this liberal and progressive uprising, this resistance, is being positively channeled as never before, directly in to the Democratic party. Progressive leaders in every locality are finding their way to roles of responsibility and elected office. It is a terrifying time in America right now, make no mistake. This uprising, however, could be the critical transition to a healthier and more united America. We just need to know what we’re doing and why. We know that when the Justice movement sets policy, it protects and nurtures widespread opportunity and prosperity. Democracy flourishes. Capitalism prospers. We all do well. We know that when the Money movement sets policy, wealth aggregates into the hands of a very few, corruption replaces democracy, and monopoly power overwhelms capitalism. We know that when the Anger movement sets policy, fear, violence, and war ensue. Hate creates great suffering, and freedom falls. As we move into this dangerous age, it is important that progressives, liberals, and Democrats learn the lesson of the three movements and the two parties. It is important for us all to understand simply, that the Justice movement brings prosperity, security, democracy, fair markets, opportunity and freedom. We can confidently move into the future, with the calm of knowing history has already proven us right. Anger, fear, hate, and violence have nothing to do with justice. They are the tools of those who would separate us, either out of ignorance or greed. We can leave the dark side to the failed nations of the Earth who succumbed to their anger. With a solid raft of democratizing, empowering, nurturing, and protective 21st Century New Deal policies, we can do for America what FDR and his progressives did in the past century. We can create a better world and a more perfect union. Next articleTrolling #Trump: A new DC-area business opportunity?